An ancient North Yorkshire monument has been recognised as being almost 1,000 years older than the pyramids of Giza. Researchers at Newcastle University have found the Thornborough Henges are one of the earliest major monuments aligned to the constellation Orion. The 5,500-year-old earthworks, north of Ripon, and the Egyptian pyramids are thought to have been built to mirror Orion's belt for its religious focus. 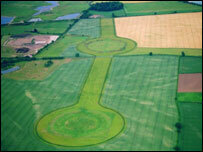 The research will be published in 2007 in a new report on the henges complex. Senior lecturer at the university Dr Jan Harding said they used a three dimensional model to confirm the stellar alignments of the henges, which date back to the Neolithic period. "Thornborough was a sacred landscape, a place of religious worship, and we should try to interpret these astronomical orientations within that context. "This astronomical association was emphasised by the banks of the henges being coated in brilliant white gypsum. "Neolithic people surely felt they were at the centre of the very cosmos as they worshipped the heavens above." The university's finding have been welcomed by campaigners opposing plans by Tarmac to quarry sand and gravel at Ladybridge Farm near the henges. Opponents fear it could destroy clues about the earthworks' history but Tarmac says the land could cope with quarrying and conservation. Members of the North Yorkshire County Council planning committee are due to meet on 21 February to decide whether to approve or reject the application.